~ Quirky semi-defunct Saskatoon folk rockers. 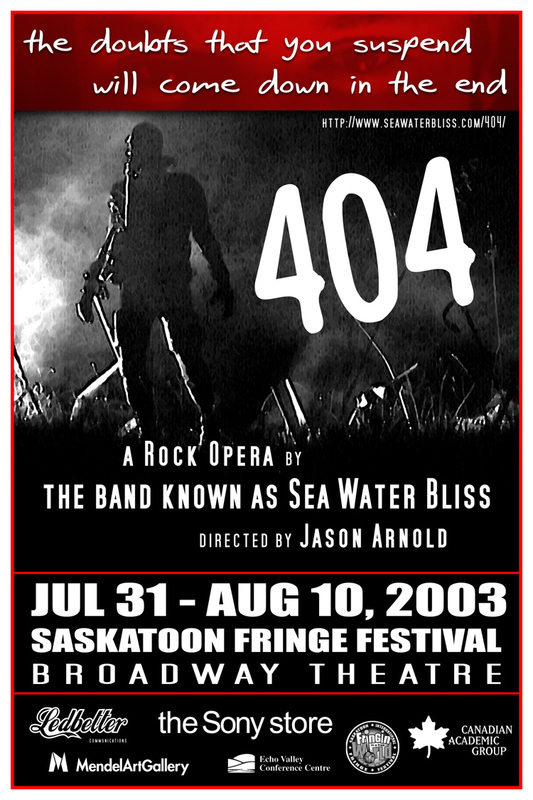 I’m not sure exactly what the above couplet means (it’s a line from our song Dream of the Descending Satellite), but we seized on it for the tagline of our rock opera 404 when we revived it for the 2003 Saskatoon Fringe Festival. 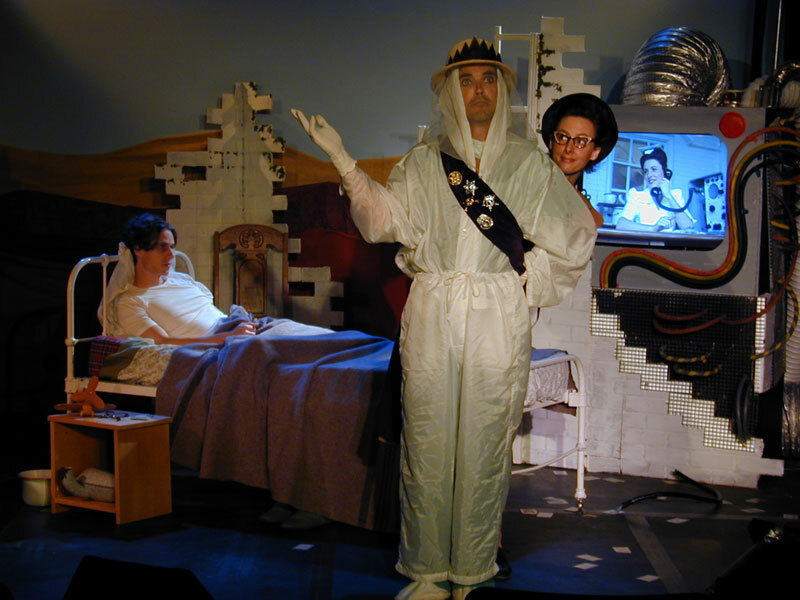 The rock opera was originally commissioned by Saskatoon’s Mendel Art Gallery as part of an exhibition called Qu’Appelle: Tales Of Two Valleys. It debuted under the title Room To Breathe in the Mendel auditorium in 2002. 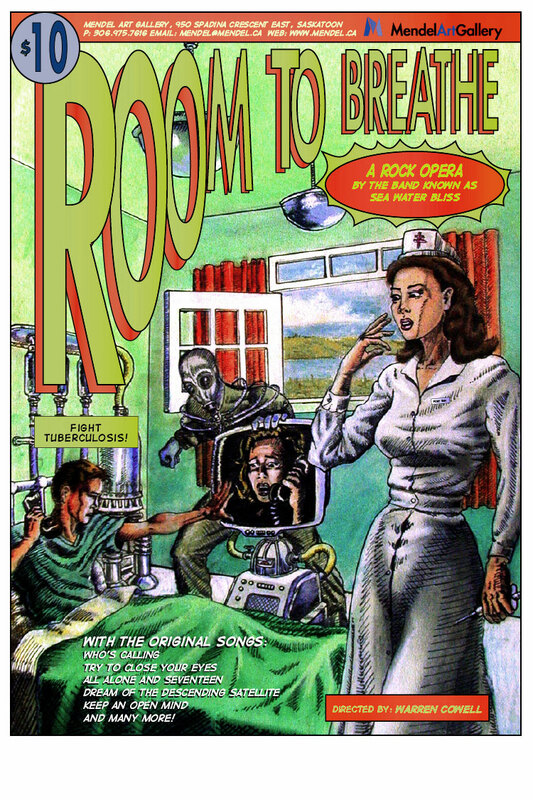 Room To Breathe – poster by Troy Mamer. 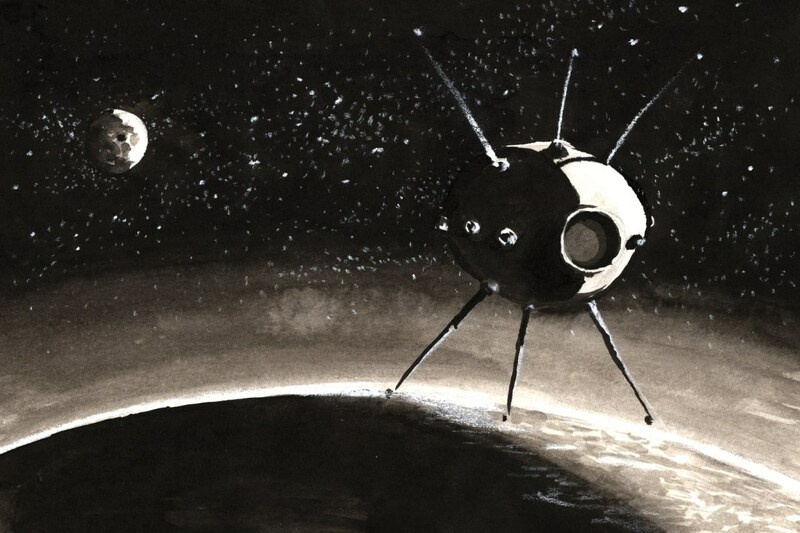 404 – poster by Chris Dally. In both iterations, the setting was the Fort San tuberculosis sanatorium in Fort Qu’Appelle, Saskatchewan, in the 1930s. A nurse attempts to cheer up a dying patient by sending a succession of visitors to entertain him: a singing cowboy, an Indian, and the Prince of Wales (the future King Edward VIII). Meanwhile, the patient falls in love with a female patient who might be a ghost or a computer program or both. 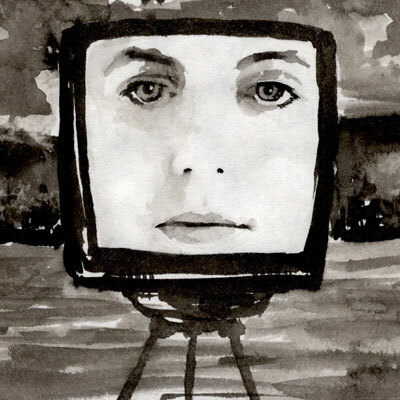 The story ends with the patient alone in his room, singing desperately to the girl’s image, frozen on a TV screen. Sarah Barss as Hallie in 404. For a variety of reasons, not least my own crappy writing, this ending never came across quite as poignantly as I’d intended. For the most part, our audiences just seemed confused. 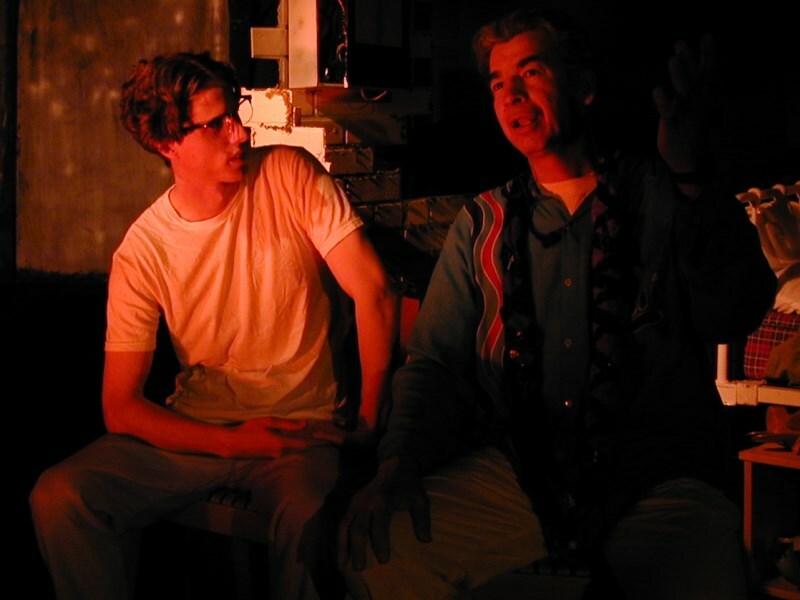 Andrew and I weren’t too keen on how things turned out when our rock opera was produced at the Mendel in June of 2002. First off, we didn’t like the title Room To Breathe, which was chosen over our objections. We found it schmaltzy and decidedly unrock-n-rollish. But the folks at the Mendel thought putting the word “breathe” in there would help tie the show in with the exhibition of tuberculosis-related paraphernalia upstairs in the gallery. We couldn’t really fight it; the Mendel was footing the bill. Secondly, in order to get the show produced, we gave up creative control, and the director imposed changes we were never really comfortable with. The songs were shortened, and the show evolved into a musical – a play with musical interludes – rather than a sequence of songs bridged by minimal narrative, as we’d envisioned. Jordan Haze and Sea Water Bliss, attempting to rock up Room To Breathe. Lastly, the tone was off. We’d conceived the rock opera as a dark fable of teenage weltschmerz. The show was intended to follow the traditional rock opera narrative arc established by Tommy – young protagonist is repressed by society, finds means of self-expression, goes crazy and smashes stuff, and finally liberates himself to a higher state of consciousness. Only in our version, the “higher state of consciousness” is a retreat into catatonic fantasy. Gloomy stuff, y’see. On the other hand, Andrew and I were well aware that rock opera is an inherently comic genre, lending itself to bombast and silliness; our unofficial slogan was “It’s a rock opera. It’s supposed to be ridiculous.” Our original concept included a female mannequin with a TV monitor for a head, a singin’ cowboy in a full-body contamination suit, and a crashed spaceman who symbolized – wait, what did he symbolize, exactly? It’s a little fuzzy. Obviously it was a challenge to resolve these tonal contradictions in the script, and I darn sure wasn’t up to the task. But the director pushed much harder on the “silly” lever than Andrew or I would’ve wanted. Maybe I should’ve pushed back harder – but I felt grateful to the Mendel for putting their faith in the project, and I didn’t want to create trouble by grandstanding about so-called “artistic integrity” (of which I have little). My few stabs at asserting myself seemed only to cause bad feelings. So after a little token resistance, I gave up and went along with the director’s changes. And that’s how we wound up with a character called Frenchy the Bartender. Don’t even ask. Diarmid MacLauchlan, Lia Pas, and Mark Ketilson getting silly in Room To Breathe. Here’s another example. 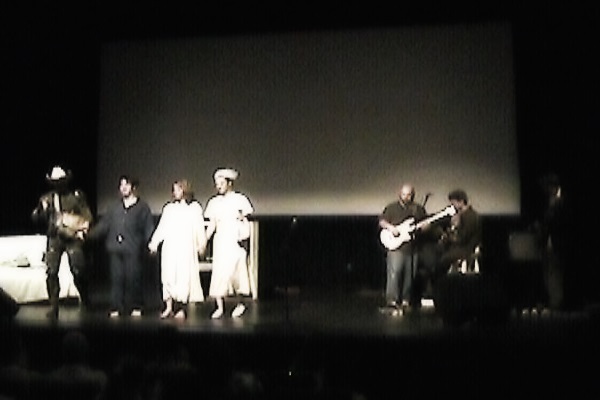 The rock opera was conceived as a tie-in with an exhibition of paintings and artifacts called Qu’Appelle: Tales of Two Valleys. The exhibition explored how artistic depictions of the Qu’Appelle Valley differed, depending on whether it was Indians or settlers holding the paintbrush (hence the “two valleys”). When I turned in my first draft, it was told exclusively from the perspective of the white hero. The Mendel said I should include some stuff showing a native perspective. Not an unreasonable demand. So I came up with a character called Joe Hump, who was supposed to be a parody of that old Hollywood trope, the Wise Indian Who Teaches the White Man a Valuable Lesson, Usually In Riddle Form. (His first song was called You Can’t Hold Up A Mountain With A Teepee Pole.) I was trying to upend a cliché. I didn’t really feel qualified to attempt to write from “a native perspective”, but I thought I could at least do the world the favour of undermining a trite stereotype. Again, I can only blame myself for failing to convey my intentions clearly. But by the final draft, I was disappointed to discover that, contrary to my best intentions, my Riddle-Talking Indian had wound up Teaching the White Man a Valuable Lesson. What was I to do? It’s very difficult, when you’re working for an institution that is attempting to demonstrate Cultural Sensitivity, to stand up and say, “Couldn’t we take all the Indian stuff a little less seriously?” I guess this is how trite stereotypes get started. Joseph Naytowhow teaches Mark Ketilson a valuable lesson in Room To Breathe. By the way, I’m not trying to run down the director, Warren Cowell. He was in a tough spot – he was given a first-draft script and a minuscule budget and he was expected to cobble together an hour-long show in a month and a half. He made a lot of choices that Andrew or I would never have made, but that’s what he was hired to do – make choices. I approved his hiring. The Mendel had offered to let me direct the show myself, and I turned them down, because I didn’t know the first thing about being a director. That was the right decision. It would’ve been an even bigger mess if I’d directed it – only a different sort of mess. So we did the show, and it lost money, but it wasn’t our money, and that was that. 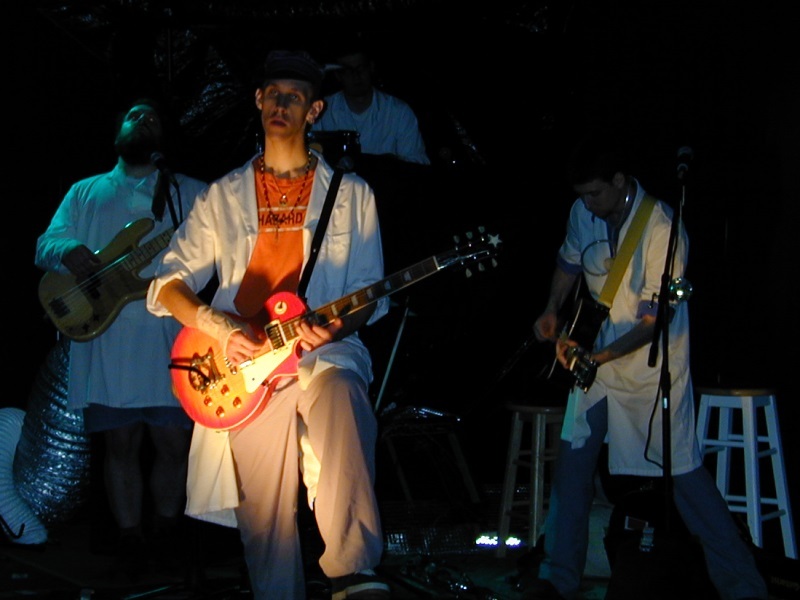 Let me first say that I loved the cast and crew we put together when we revived the rock opera for the 2003 Fringe Festival. Although adding the responsibility of de facto producer, on top of composer and performer, created massive stress – for Andrew and Olin no less than for myself – I still had more fun working on this show than I’ve had doing anything else, ever. With the first show, I was able to blame its failures on the fact that we had allowed ourselves to deviate from the original “vision”. I have no such excuse for the failures of the second show. Within the limits of our budget, this was the show I, at least, had visualised. And it still didn’t work. Damien Bartlett in the inexplicable climax of 404. We had every break. We had the comfiest, most spacious, least acoustically-challenging venue in the Fringe – the newly renovated Broadway Theatre. We had pretty girls in the cast. We had knockout posters. Most importantly, we had complete creative control – no more Frenchy! – and we still couldn’t make it work. To be fair, by Fringe standards, we did okay – roughly average attendance. But we needed to do much better in order to break even. Between the filming trip to Fort Qu’Appelle, and renting sound equipment, our show was already many times more costly than the average production. And then, in our inexperience, we neglected to market the show as well as we should have. Hell, we were busy up until the last minute just trying to make the stupid thing make sense. My fault. So we wound up deeply in the red, which naturally colours one’s recollections of the whole adventure. Damien, like the story, shrouded in fog. This wasn’t solely a failure of the songwriting. I rewrote many of the songs between the first and second versions of the show, in every case for the better, but there were still a few stinkers in there. The real problem was structural. It’s hard enough, when writing a non-musical play, to make the scenes flow in a way that is both clear and emotionally engaging. In opera you also have to make sure the songs flow in a way that makes sense musically. For instance, you might like to swap around some lines of dialogue, but if you do, the bridge winds up in front of the first chorus which is followed by three verses in a row. That won’t work. So you leave glaring dramatic flaws unfixed in order to avoid introducing glaring musical flaws, and vice versa. Jan-June 2002. As we put together the production I kept my friends up-to-date on our progress via email. Here you can see what was going through my head as I struggled to finish the script, quarrelled with the director, and finally laid the rock opera to rest. Jan-Aug 2003. Once again, witness my deteriorating mental state as I disinter the rock opera and attempt, with the help of my friends and bandmates, to jolt it back to a shambling semblance of life. August 2003. In Saskatoon’s free weekly “News, Arts, and Entertainment” paper, critic Jorge Ignacio Castillo takes a bludgeon to 404. 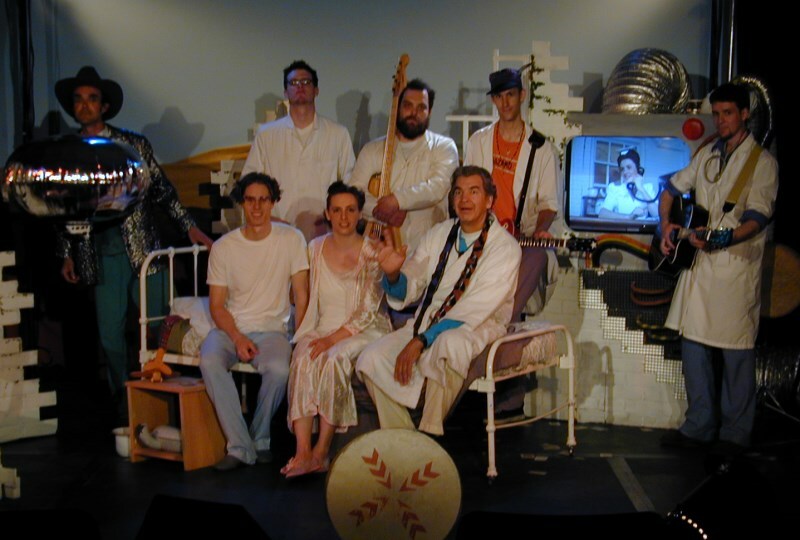 The first production of our rock opera was directed by Warren Cowell and starred Lia Pas, Mark Ketilson, Diarmid MacLauchlan, Joseph Naytowhow, and Tracy Smith (who also stage managed). Our producer at the Mendel was Troy Mamer, who also illustrated and designed our extraordinary poster. 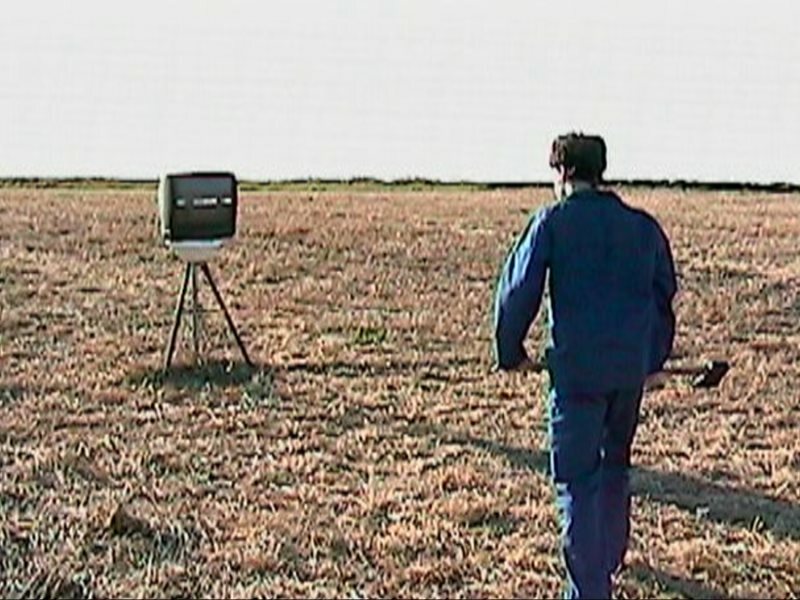 The video footage was filmed and edited by Armin & Ermin Badzak at Next-Illusion.com. In addition to Andrew and myself, the band included Jordan Haze on guitar and Aaron Adair on drums. The following year we revived and retitled the show for the Fringe. This version was directed by Jason W. Arnold and starred Sarah Barss, Damien Bartlett, Charlotte Brandrick, and Scott Kuemper. The stage manager was Mark Howard Whitbread and our friend Jenn Pereira acted as producer. Chris Dally of Ledbetter Communications designed our posters, which incorporated artwork by Troy Mamer. The band consisted of me, Andrew, Olin, and Trevor Miller on drums. Buy our album (for just $8 US). 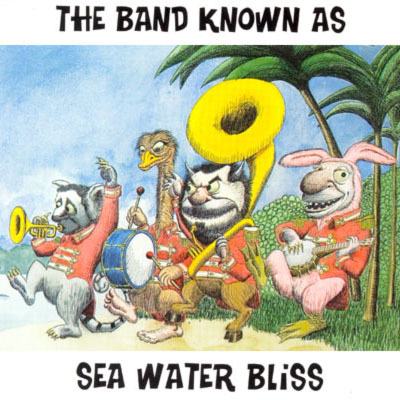 Possibly you arrived at this page by following a link related to one of the videos Sea Water Bliss has put online over the years, many of them completely unrelated to the band and its music. You can learn more about these videos and their creator at The Michael A. Charles Online Presence. If you're still not sure why you're here, you'll want to start by reading the Frequently Asked Questions on the About page, then listening to some of our music on the Songs page. After that, If you're still interested, you can dig into the history of our rock opera 404.